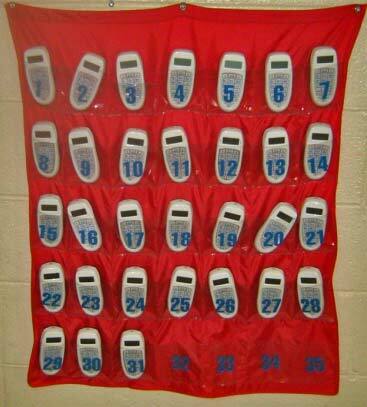 Are you struggling with clicker organization in your classroom? Your student response clickers are engaging your students, adding a new spark to your classroom, and raising your test scores, but you're looking for a creative way to keep them organized or effectively distribute them to students. Does this sound like something teachers in your building are struggling with? 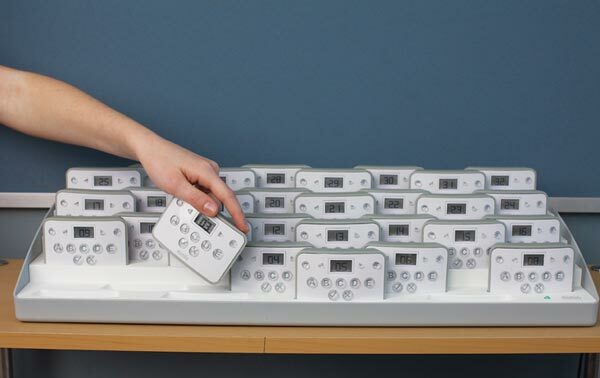 MimioVote clickers come with a storage rack that simultaneously charges each clicker. Clicker organization is especially important for those using clickers daily. We recommend using clickers daily rather than as a "special treat." Students can benefit from instant feedback and increased participation, and teachers benefit from "on-the-fly" formative assessment. Bill McIntosh, our friend and eInstruction colleague from South Carolina, sent us the following picture and description about using a calculator caddy for storing and organizing clickers. "Teachers are inherently resourceful people. A number of teachers I have talked to have 'repurposed' this kind wall bag, designed for calculators as a handy way to dispense, and keep up with their CPS response pads. One glance tells you if a pad has gone astray. I did a google search on 'calculator caddy' and found several sources for this kind of wall bag on the internet." This really is a fantastic idea if you are lucky enough to have your own set of clickers that you don't have to share with other teachers in the building (and we really hope that each of you is that fortunate)! It is just an easy glance to see if all the clickers are turned it, and they are up and out of the way. Below is the best price we have found for a Calc-U-Store pocket chart. Many of the calculator caddies will run $40-50, but these are less than $20. They also don't say "Calculator Caddy" at the top, making them a much better choice for clickers! Thanks for this great idea and picture, Bill!